The few weeks ago we began potty training Isaac. I plan to write a post on all that, but until then here’s a short post about how we went from Diaper Pack to Potty Pack. One of my all time favorite baby/kid items is this Skip Hop Pronto Diaper Changing Kit. This is actually my 2nd. When a zipper broke, Buy Buy Baby replaced it for free with a brand new one. They rock like that. This is what it has looked like the last year or so. While I usually keep a change of clothes and extra diaper in the car, this is easy to throw in my purse (which is actually a bag), instead of carrying a whole diaper bag. When Isaac was little baby I also left the changing mat attached. He outgrew the length, so now I mostly leave it off… thank you easy zipper. Now that we are into potty land, we said goodbye to diapers! I put a few pairs of pants and underwear in the pack along with a plastic bag for the possible messy cloths. I also grabbed a travel size of the moist wipes to have in case of a poop while we are out. It is super handy to grab in and out of my purse when Isaac is with me or give to Doug if he takes him out. And since Skip Hop patterns are kinda hip, you’d have no idea what is hiding inside. See ya next year diapers! This entry was posted in kid stuff, organization, systems and tagged bag, diaper, need, out, pack, potty, skip hop on October 18, 2013 by projectmomma. I just returned from the International Nanny Association Annual Conference. My 5th! Though I am currently not nannying, I am still very involved in the industry and with our local CincyNanny community. I get so much out of this conference both personal and professional. I come home energized, excited, but a little afraid. I desperately want to make sure that the seeds planted at conference will grow. That the ideas that challenged me would be set to action. That I would live passionately and never settle for so-so. I usually debrief my trip on the plane ride home. I’ll journal and make a “to do” list. I was able to drive to this conference and now find my mind still swimming with the information, ideas, and memories. So as I process, I thought that I would share it …via the blogosphere. Yes, we all unpack and do laundry when we get home. But, it is important to notice items that you brought home and remind yourself of items you wish that you had taken – business cards, more cash or better walking shoes. If you had a packing list, update it! 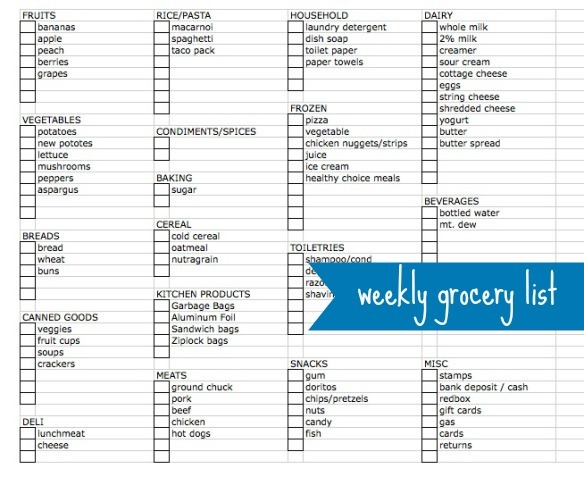 Make a note or create a generic packing list for next time. Grap a letter-sized envelope and place all your conference receipts inside. Include items you paid for ahead of time, like travel expenses. Depending on your career, items may be deductible. Tally up your expenses on the outside of your envelope by category and you won’t have to think about it come tax time. Lay out the business cards you collected and/or the contact list of attendees (if available). Take some time to find these new friends with social media whether it be linked in, facebook, twitter, etc. Send a message to the ones that you had a nice connection with and would like to stay in touch. You may even want to share pictures or write a hand-written note. Conferences are a great place to find new experts and professionals in your industry. Note who inspired you and find them! If you liked their information at conference, make sure you’ll receive more after conference. Follow their blog, order a book, register for their newsletter, follow them on social media. Set yourself up to be inspired by them again…even virtually. After you have sorted through all the papers, notes, biz cards, etc. package them in a way you can reference them. For this conference I just attended, I like to file all my items in my ‘Nanny & Kids Resources’ Binder. Nothing fancy, just a 3 ring binder where I drop notes. I do make sure to have dates, location, and speaker/author on all my notes. By the way I don’t keep everything. Don’t hang on to things you know that you won’t use. A few days away from normal life can really inspire you. Don’t let the opportunity for life change just pass you by. Schedule a block of time to debrief – alone, just you. Get out of your house for a few hours, take your conference notes, and write out at least 3 action steps for yourself. This might include how to come back to the same conference or to just get away more often. Whatever the next steps write them down. Then…. follow through and do them! My debrief time is going to be Friday afternoon. What about you? What do you do upon returning from a conference? This entry was posted in organization, rhythms, systems and tagged action, after, agency, conference, education, goal, international nanny association, nanny, to do, what now on April 16, 2013 by projectmomma. Our kitchen has many problems. For now, let’s ignore the fact that our fridge is avacado green, our cabinets are laminate, and the floor is….well, dingy. We hope to gut it someday in the future. But the problem functionally, is that it’s so small! We have limited storage, it’s awkwardly shaped, and like many homes it is the entry, exit and hub of the house. I specifically bought a high-top kitchen table so that it could act as another counter while cooking. But, instead, it has become the ‘drop zone’. And, really… it is my fault. We have with no mudroom and limited space in the garage. As I walk in from a busy day I usually unload my work bag, Isaac’s bag, lunch bags, coats, shoes, mail, the paper, groceries, and whatever else I have in my hands. So the challenge: get my kitchen table back. Part 1 of this project is to clear the clutter and assess what is piling up. Each item needs a home and a system to get it home on a regular basis. I’ve learned that just cleaning the table is not enough. The pile reappears as soon as a busy work week starts up again. None of these items belong on the kitchen table. They are either on their way out of the house, on their way back in or waiting for time to do a project. Isaac’s things can go to his room, dishes and lunchbag can be put away in the kitchen. The card box belongs in the dining room closet (which is like my misc spot/office). From looking at these items, I think I need an “in process” container and a “projects” container somewhere, so those items don’t sit on the kitchen table for weeks until I have time to do them. Keys belong in a tray on the microwave. Chapstick and phone accessories go in my purse. Nail polish goes to the bathroom. Office supplies to the Dining Room closet. Beyond that, these items, mostly paper or organizers with papers in them are constantly hanging out on the table. They need places to live. I do not want to see them! I also need to be able to easily grab office supplies and easily put them away. Gloves hang out in my purse. The large Mommy Hook, changing pad and wipes go to the car. Bags go in the garage. The misc. papers need to be filed in the dining room closet. OK, so I have been holding back on you. I do have a clue as to why these items, a lot of them paper, are accumulating on the table. My closet in the dining room is worse than this table. It is my misc spot and it is out-of control!!! So, there you go all you people that think that my house is perfectly organized. I have monsters in the closet just like you. The reason they are literally in the closet, has to do with a certain 17 month old. Now that he can get into everything on the bottom part of the house, I’ve had to move, hide and store things differently. The dining room closet has become the misc. safe place for alot these items. Ready for the scary picture? Items falling out as I open the door. Paper piles that are growing. More projects in a bag, I cannot even see the files! Oh, it is time!! So, there will be a Part 2 of this project. It is contingent on creating some space in that closet. Assessing what was landing in the ‘drop zone’ has prepared me to create some thought-out, systematic, and organized zones in the closet. Ooh, it gives me chills just thinking about it. Again, my goal is to create new habits and maintain a clean kitchen table. Oh, let’s at least enjoy the picture of the clean kitchen table…ahhhhh. 3. Location for coats, shoes, purse, diaper bag, and work misc. —> closet and other? Hang in there. There are a lot more nap times of work in my future. I will fill you in soon. This entry was posted in diy, project, systems on February 23, 2013 by projectmomma. Back in December, I drew a 6th grade looking artwork piece of things that I wanted to experience during the holiday season. I hung it up in the kitchen where I saw it everyday- reminding me of great times to be had (and the fact that I am not an drawer). It actually worked, we did almost everything on my picture-goal-experience sheet. So, I thought I would try to do it again, only this time it would include my projects, some fun and some not as fun. Maybe I will do this each season? And since I have been playing with PicMonkey, I decided to make my picture a little more graphic. They are all pretty self-explanatory, so I will save the details for later posts after they are done! Wont you join me for Winter 10? Post a blog like this and link in the comments. 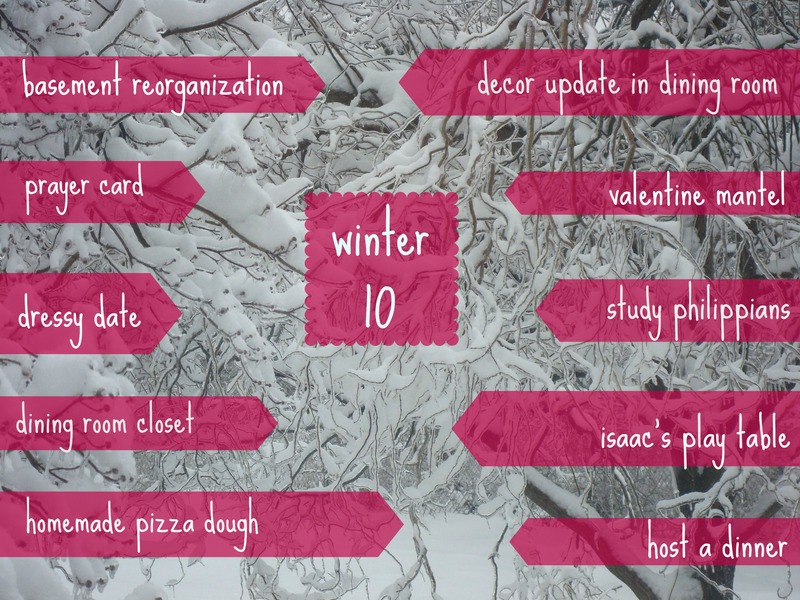 This entry was posted in project, systems and tagged winter 10 on February 3, 2013 by projectmomma.